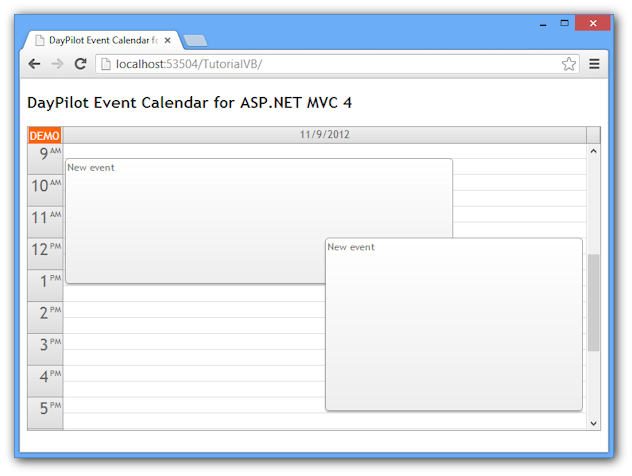 With DayPilot Calendar for ASP.NET MVC, displaying events in a calendar view in ASP.NET MVC 3 is easy. Library: Include DayPilot.Web.Mvc.dll and scripts in your project and add a reference to it. 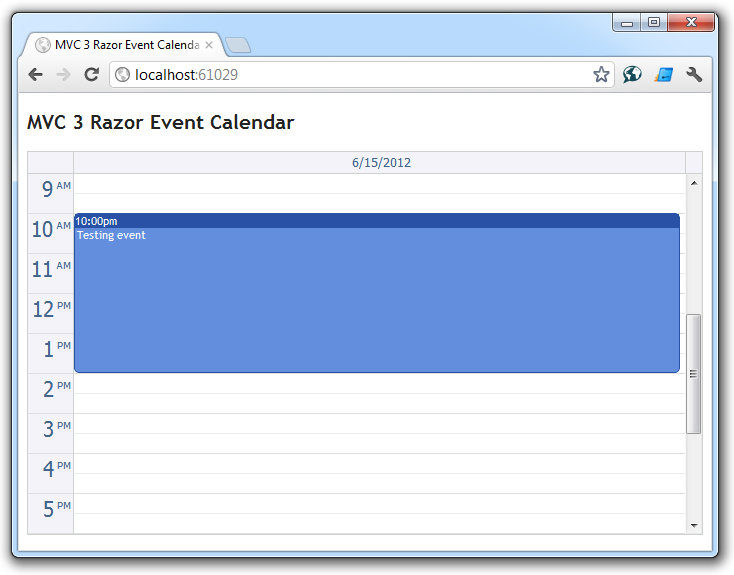 View: Create a new MVC 3 Razor view and add DayPilot Calendar widget using Html.DayPilotCalendar extension. Controller: Create a MVC 3 controller that will supply the data. Download DayPilot Pro for ASP.NET MVC trial package or DayPilot Lite for ASP.NET MVC open-source package. 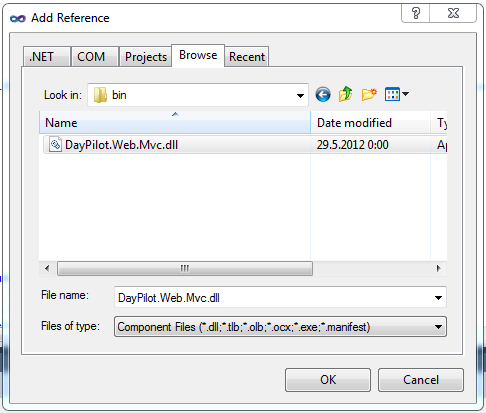 Copy DayPilot.Web.Mvc.dll from the Binary folder of the package to your project (Bin). Add a reference to DayPilot.Web.Mvc.dll. Note that although DayPilot is compatible with jQuery it isn't required. Note that the minimum required code is quite short. It only has to point to the backend MVC controller ("~/Home/Backend") that will supply the calendar event data using an AJAX call. Add a new action handler for the calendar backend. It will be accessible as /Home/Backend. 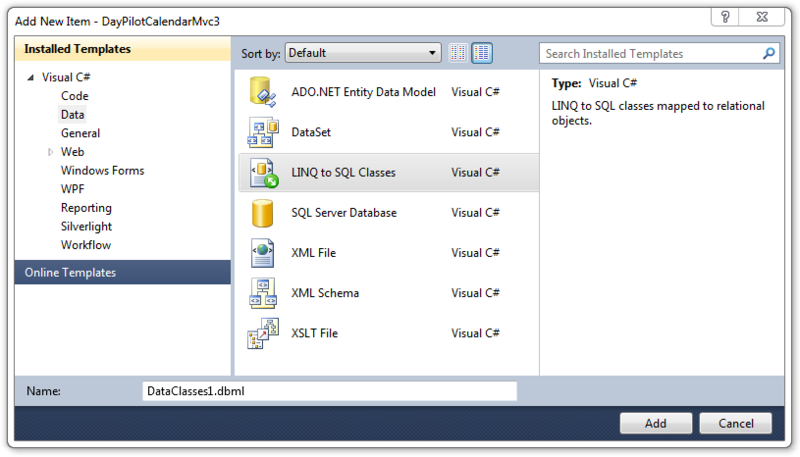 We have loaded the calendar event data from a simple MS SQL table called "events" using LINQ to SQL classes generated using Visual Studio 2010 wizard (DataClasses1.dbml). This tutorial shows how to use the DayPilot Pro MVC Calendar with MVC 4 and Razor engine. 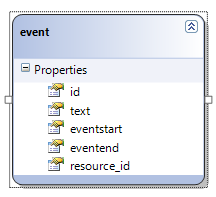 It will load calendar events from a database (SQL Server), and allow event creating using TimeRangeSelected event and event moving using drag&drop. 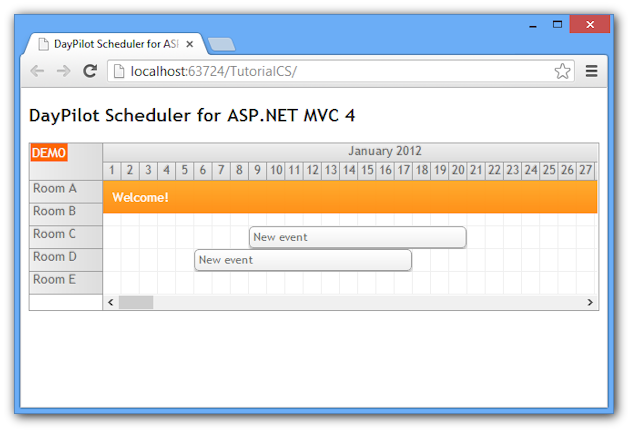 This tutorial shows how to use the DayPilot Pro MVC Scheduler with MVC 4 and Razor engine. It will load scheduled events from a database (SQL Server), and allow event creating using TimeRangeSelected event and event moving using drag&drop.